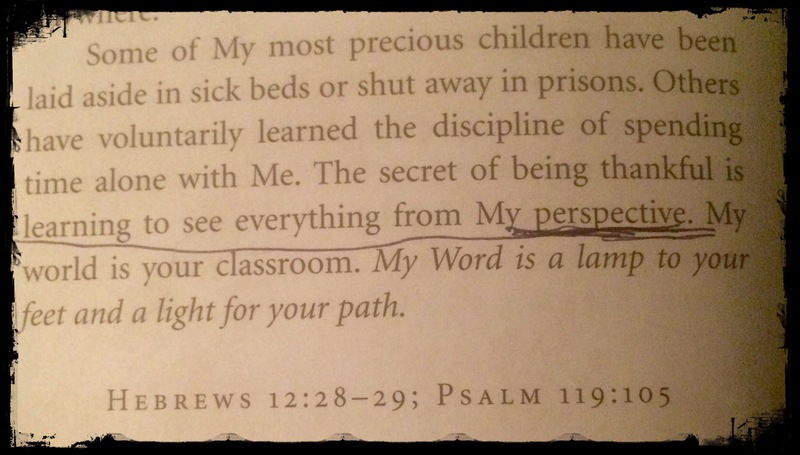 It seems like the word perspective comes up in just about everything I see and hear lately. God had given me the word to use in my blog a while back, and ever since then BAM! I’m hearing/seeing the word perspective everywhere! Let’s look at the definition. It’s extremely difficult when a loved one, friend, coworker, person we have a casual conversation with in Walmart, or pretty much anyone we may encounter, doesn’t share our perspective on things. I mean, let’s face it, if we’re right, then the other person is wrong, right?! That’s what I thought! But isn’t it our perspective that shapes our opinion on everything we see and hear?! And hasn’t our (those of us who are 1) Christians, 2) lived to see 40) perspective changed a whole lot in the last twenty years, or since we’ve been living for The Lord? I know mine sure has! Seriously, when it comes to our children, it’s tough to sit back and watch them live their lives with the wrong perspective. As adults, who’ve been there and done that, we have a tendency to try and force them to see things our way, but it didn’t work on us, and I don’t reckon it’ll work on them! I’ll tell you something though, when I hear one of mine say something that I know they’ve been taught better than to believe, it pisses me off! Oh crap! Can I say pisses? Oh well, I hope I can because I did! Anyway, I want to yell at them and tell them that they know better, and ask them why in the world they remotely think what they’re saying is right; and there have been plenty of times when I did! However, deep down I know that doesn’t accomplish one thing. Deep down I know that trying to shove my perspective down their throats only prolongs their agony, and mine as well, because I have to sit back and listen, grit my teeth, and anxiously await their inevitable, rude awakening! And God gently reminds me of how screwed up my perspective was until I saw things His way. So, what are we parents to do while we wait? We let our children fail and stop trying to fix everything! We remain silent (sometimes). We live our lives according to God’s (our) perspective (because they should match) and don’t just talk about it! We let them know that no matter what, we will always love them! And most importantly, we pray hard for God to change their perspective from theirs to His! This was part of my Jesus Calling devotional this morning, and boy, did it strike a chord. Let’s not get angry or aggravated with those who have a jacked up perspective. Let’s not think that anyone is a lost cause! And let’s try not to fall apart when we see our children heading down a wrong path. Remember, this whole world is God’s classroom, and God is the most awesome, loving, and creative teacher who ever lived! Let’s pray that our people will become good students, and that they will hear, and understand what The Teacher is trying to teach them! Let’s pray that none of us stop learning, because we all veer from time to time. And when times get tough let’s encourage each other! Previous Post You Can Do It! You Can Do It All Day Long! Next Post Hear No Evil, See No Evil, And Certainly Don’t You Speak No Evil!